Hi there, Helen from Cloth & Ink here, excited to share a crafty DIY with you all. 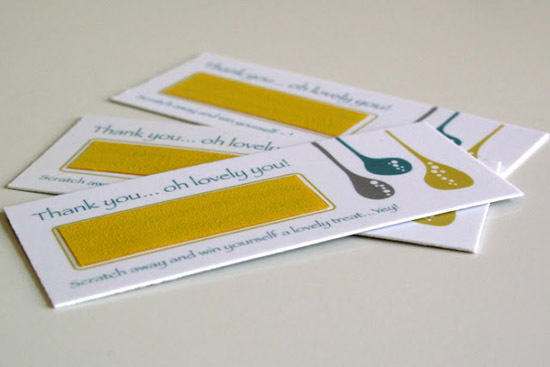 Recently I had been thinking and thinking of a fun, interesting way to give my wonderful customers a coupon for my shop when I came upon the idea of making scratch cards. So the search began...'Tutorials on making scratch cards'. Here's what I found; an idea from Martha Stewart, one by Wonder Forest and finally Artmind, you may like to check them out too. So after deciding on my own version I went ahead and... voila! So here's the how to: First of all you are going to need cards for the base of the scratch cards. 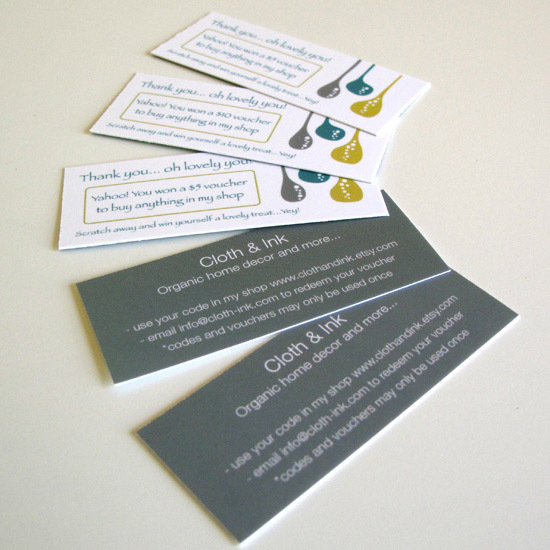 These could be be similar to your business cards but feature the all important coupon code. 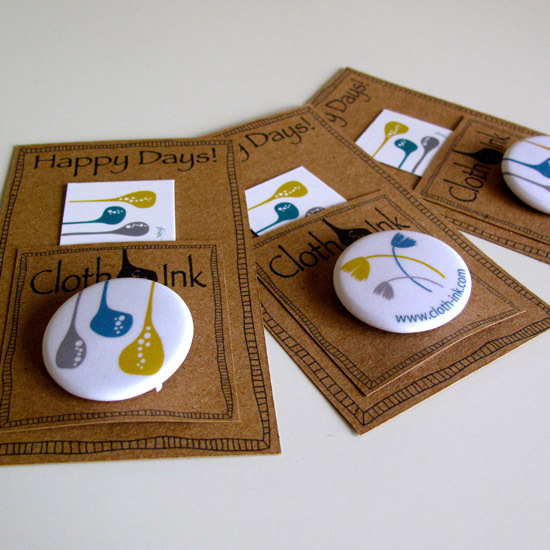 You could do these yourself or have them printed for you, whichever you find most cost and time effective. Here's what mine look like. Washing up liquid - oh yes! Start off by mixing the washing up liquid with acrylic paint, 1 part soap to 2 parts paint. Many of the tutorials show the classic silver scratch off used on commercial scratch cards, that's great, but I fancied something a little more colorful. 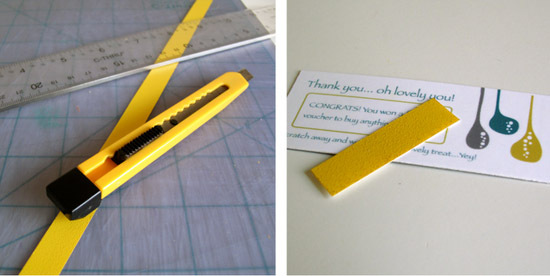 I went for a yellow to match my shop branding, you could even do more than one shade if you can't make up your mind! With your roller, paint the surface of the plastic. You'll have to do 2 or 3 coats depending on the paints you use. I'd recommend trying a test area just to make sure it's going to scratch off the plastic you bought and to make sure the paint isn't too thick. I'm not sure how it works but it's the washing up liquid that makes the magic happen. With the plastic sheet dry, you can can now cut strips, using a craft knife, big enough to cover the coupon panel on your card. Peel of the backing and stick the plastic to the card. How easy is that! Here's my results, I'm so pleased with them. I plan to use them at an upcoming show and I'll be sending one out with each order I receive online. Don't miss out on the fun, visit my shop and see if you can get the grand prize $20 voucher. I also made a cute little pocket for my scratch cards and I'll be sharing a printable for making these in my next 'How To' on Cloth & Ink's blog. Working from home, Helen designs and produces screen printed textiles and makes home decor products from these. She begins each design with a hand drawn illustration inspired by urban and rural landscapes and the surrounding waters. Each design is printed by hand using earth friendly inks. Visit Cloth and Ink online this month at Poppytalk Handmade where she is offering a discount for Earth Day in her shop for all Poppytalk Handmade Readers. Just use coupon code EcoPop12 and receive 15% discount on your purchase! Elsewhere: shop | blog. What a great idea, thank you for the tutorial! This is an awesome idea! Thanks so much for sharing the tutorial. I will definitely be putting this on my to do list. I've seen the DIY scrachers before but this is a cool way to use that idea. Thanks for sharing!